Only a few times in history has a musician been singled out as the world-class master of his instrument. Billy Cobham is one of those few artists. For over 30 years, he has received international acclaim as the total consummate percussionist. 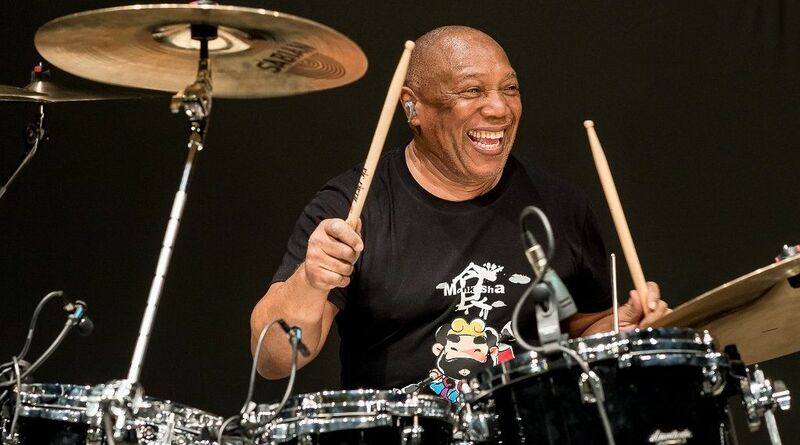 The legendary Billy Cobham, with his matchless, dazzling, ambidextrous skills as a drummer, has applied the same insistent fervor to his long list of monumental achievements. He’s an accomplished composer and record producer. He has performed on hundreds of records with his own groups and with some of the music’s most luminary artists, and his trademark - biggest, fastest, explosive drumming - has energized the international stages of concerts, symphonies, big bands, Broadway, festivals, television and video. He has been a teacher of his artistry, giving drum clinics, conducting workshops and symposiums throughout the world. His stylistic influence, which has literally created a category of music, is an outstanding part of the history of modern music. BILLY COBHAM BAND : Jean-Marie Ecay - guitar, Michael Mondesir - bass, Junior Gill - steel pan/Pan Cat Mallots, Christophe Cravero - keyboard/violin, Camelia Ben Naceur - keyboards.